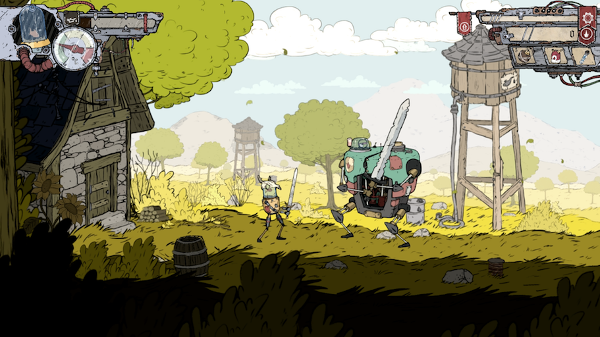 For lovers of quirky animation with an organic feel, look no further than Feudal Alloy, a sidescrolling metroidvania RPG that sports a fish as the protagonist. But a fish piloting a suit of robotic armor. With a medieval landscape in a curiously low-tech setting (if you ignore the lasers, rotating knives, bombs, etc). Also, note that conversations happen by way of animated speech bubbles. As such, I chatted up dev Eva Balikova, noting the unique art elements of the game’s huge, interconnected world. 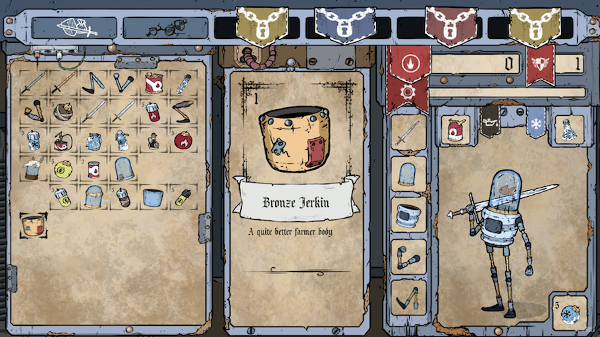 Erik Meyer: Feudal Alloy drops players into the role of Attu in a world populated by fish-controlled medieval robots, and I’m curious about this combination of elements; how did you arrive at this quirky combination of low tech meets high tech, and how did the fish come into play? In following, why does it make perfect aesthetic sense? Eva Balikova: I’m not sure of it, entirely. After we finished our first game, my partner Lukas was just sketching some characters and we really liked this one with a robot controlled by a fish in its head. We had our fish-robot characters and we thought: what environment we could put them in? We wanted something uncommon, so we came up with this crazy medieval world. I hope it makes Feudal Alloy stand out a bit. EM: The animation style, the menus, and the different equippable options remind me of old cartoons, retaining playful visual jokes (skill trees are actual trees) while communicating key information, so when it comes to the visual elements, what design philosophies do you maintain, and from a developer vantage point, what unifies the artwork? EV: Yes, we’ve always liked the style of old cartoons and children’s comic books, and for no good reason, there aren’t many games in that style, because people seem to like it. And actually, we don’t really maintain any design philosophy or art style. We are beginners and are learning everything by creating this game. We’re just trying to make what we like. EM: I enjoy the animated dialogues and the concept therein; when it comes down to visual simplicity, what ideas do you find easiest to convey in pictures, and what concepts do you find irksome? As you’ve implemented this aspect of the game, what hurdles have presented themselves? EV: The reason why we use the animated bubbles is simple. We don’t like a huge amount of text in the game (except the item attributes and descriptions, of course), and there are not many games that have this kind of animated bubbles out there. We thought it would be easier, as we wouldn’t have to translate all the dialogue text, but it turned out the animations are way more difficult to make. EM: The meshing of time period technologies fascinates me, in terms of what works and what doesn’t, and it seems like there’s something very raw and simple in medieval/feudal methods of war/farming/life that carries over into the steampunk-esque robot style you’re using (exposed gears, tubes, switches, pulleys, etc). Similarly, the renaissance might correlate to ornate clocks, micro-circuitry, and digital displays. As you choose what to include/leave out and implement everything from house designs to buzzsaw arms, what guides you? 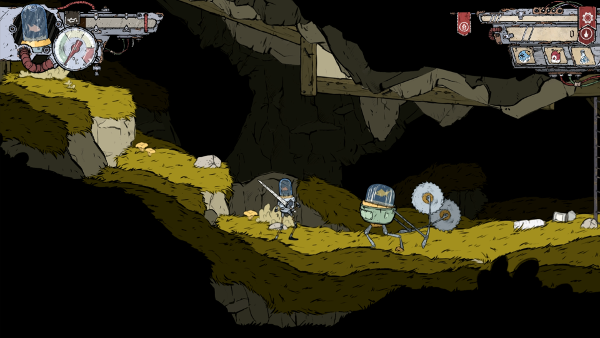 EV: Feudal Alloy is set in an odd world in the far future where the fish built mechanical bodies from the relics of lost civilizations. It means there’s a lot of human technology (teleporters, electric power), but they had to build a lot of things from scratch. I like steampunk; the combination of wood and metal looks great to me. EM: Your devlog illustrates the wide variety of things you’re adding to the project, including fast travel (the animation is beautiful), bombs that freeze enemies, combat options like parry, and a variety of foes, so as you weigh different features (which take a fair amount of time, no doubt), what criteria helps you decide what to add and what to leave out? And as a studio, what does this decision-making process look like? 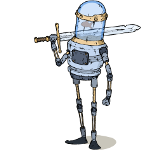 EV: Well, we wanted Feudal Alloy to be a much smaller game, to be honest, but we kept adding cool new mechanics as the project went. At first, we try to prototype something we think will be great, play it for a while, tweak it, and if it’s good, hand it off to some players to try. We posted on Reddit and asked for feedback. People responded, sharing how they enjoyed playing the game, along with some interesting notes. Now we’re glad we did that. I would recommended Reddit for everyone who needs help with his/her project. But we can’t add everything we want, of course. Many features take too much time to implement, and we want to release the game in Q3. As we are just two people, me and my boyfriend, it’s not difficult to make decisions. Mostly, we like the same kinds of things. EM: You’ve shown some behind-the-scenes of level design, so from a player interactions and flow of information perspective, how do you approach level design? What makes for solid replay value, and what makes things hard (but not too hard)? You have a wide variety of elements (platforms to jump across, ladders to climb, ground enemies, flying enemies, loot, etc), so as developers, when do things feel *right*? EV: We love games like Hollow Knight, Ori and The Blind Forest, Salt and Sanctuary, and Guacamelee, so we are trying to achieve a similar feel to those titles. As we are new to game development, we are just looking for stuff we like in similar games and trying to use and adjust those ideas for our project. We don’t have enough experience yet, so we’re sticking with classic structures from metroidvania games, in term of level design. Nothing fancy. EM: Prior work includes Toby: The Secret Mine, which has a very different visual look and play feel, aside from being a sidescroller, so what carries over from past projects and into your current work? What techniques, code elements, or style choices do you find sticking around? EV: Toby was our first game, and we knew literally nothing about game development and marketing. When we started working on it, we didn’t have anything prepared, and that was a problem. The game looks quite good but has really horrible design and execution aspects. 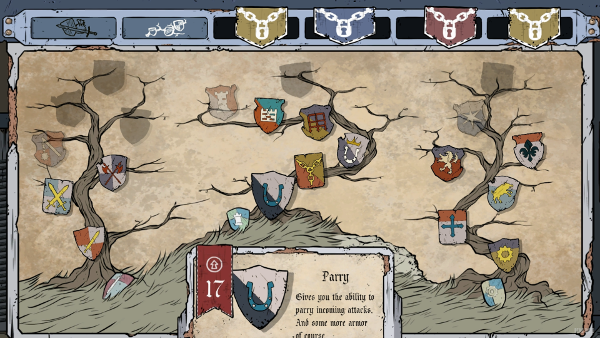 We wanted our next game to be better implemented and more complex. EM: As you add polish, what kinds of careful design details (backgrounds, customization options, Easter eggs, play style variety, for example) do you feel have the biggest impact on making lasting impressions with players and give games the kind of depth that moves the needle from good game to great game? EV: Not sure, to be honest. We are still learning by trying. I think the biggest impact involves whether the game is “fun” or not. Standout art can bring attention, but if the core game elements aren’t fun, nobody will like playing it.